I just had to share. I love this gorgeous dragonfly brooch by Miko Omigamu of ICING. I saw it on a woman passing me by and I just to stop her and appreciate it. It’s absolutely an intricate charm and perfect for the coming spring season! I own a piece or two if ICING clothing and adore the excellent quality but especially the consistent designs. Many floral patterns. One can never have enough floral patterns in their wardrobe. 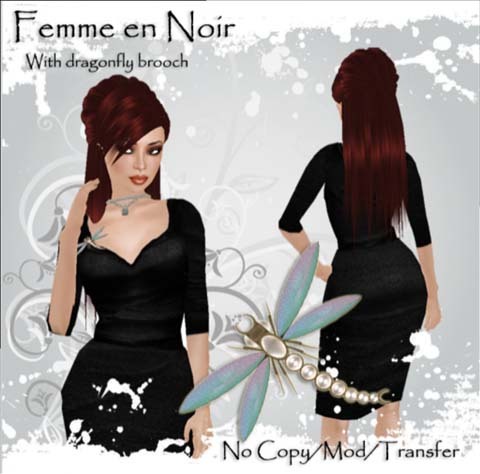 — This dragonfly brooch seems to be the only jewelry type item for sale in the shop and it conveniently comes with the Femme en Noir outfit. ICING store is currently having a 50% off Sale so the brooch with the dress is only 147L at the moment. I love this. You will too!Buy it, rotate it, adore it! For someone who focuses on apparel this gem of a brooch is better than the quality of many jewelry-focused designers. Miko Omigamu, make more jewelry!